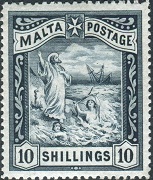 Malta stamps were first issued in 1860, during the reign of Queen Victoria. Malta, with 6,000 years of archeological history and about 3,000 years of recorded history, is one of the most important places in the Mediterranean World. 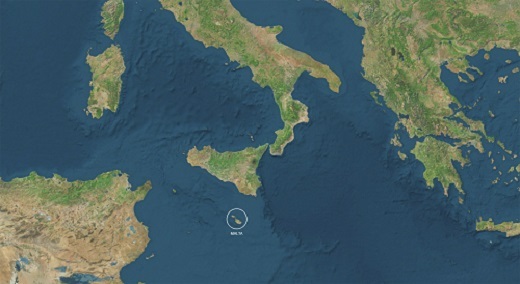 Due to its strategic location between Sicily and Northern Africa, it has been a cherished prize, fought over by many empires, since the beginning of time. The generalized chart below reflects the many political changes that have taken place during Malta's evolution. Before the appearance of the first Malta stamps in 1860, the postage stamps of Great Britain were used in the island. Even after that time, British stamps were often used concurrently with those of Malta. These British stamps can be identified by the "A25" numeral-in-grid postmark or the MALTA circular date stamp. Three examples are shown above. These "forerunner" stamps of Malta are actually relatively common and inexpensive, and they can make a beautiful collateral display for any Malta collection. Considering the massive number of different types and varieties of definitive postage stamps issued by other British colonies during the late 19th and early 20th Centuries, the postage stamp issues of Malta during this time period are actually rather conservative. During the reign of Queen Victoria, there were only 20 major issues, and during the reign of King Edward VII, there were only 25 major issues, and all of those include perforation and watermark varieties. The postage stamps of Malta, as far as major issues, are actually "completable". According to the 2012 Scott Standard Postage Stamp Catalogue, there are only three stamps (mint condition) that catalog over $500, and only one of them catalogs over $1,000 ($85 with a revenue cancel). For most dedicated stamp collectors, that is not an insurmountable task. With the very wide range of subject matter, and the fact that many of the early pictorial definitive stamp issues of Malta are engraved, the stamps of Malta can make up an aesthetically beautiful collection. 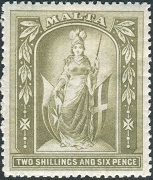 Historical articles and reviews of the postage stamp issues of Malta will eventually appear in the link section at the top of the third column of this page.